Crowns are dental restorations otherwise known as “caps” which are coverings that fit over teeth. 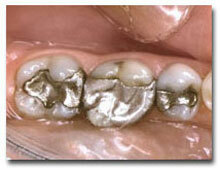 Crowns may be necessary because of broken down old fillings, fractured, chipped or sensitive teeth. 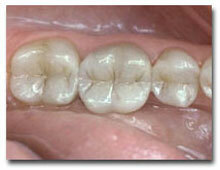 Crowns are also used to improve the appearance of natural teeth that are malformed, mal positioned or discolored. Crowns can be made from different materials which include the full porcelain crown, the porcelain fused-to-metal crown and the all-metal crown. You and your dentist will decide which type is appropriate, depending upon the strength requirements and esthetic concerns of the tooth involved. Root canal – After root canal, teeth tend to become brittle and are more apt to fracture. These teeth need to be protected by a crown. The first visit begins by giving you a local anesthetic. Depending upon the type of local anesthetic used, you can expect to be numb for one to four hours. If your anesthesia should last longer, do not be concerned. Not everyone reacts to medication in the same manner. One word of caution : While you are numb, please be careful not to bite your lip or tongue. A soft diet or no meal at all while you are numb is probably a good idea. If your child has been the patient, please watch them carefully to be sure they do not play with their tongue or lip while it is numb. Once you are numb, your dentist will prepare your tooth in a very specific way in order to maximize the retention and esthetics of your new porcelain to metal crown. After the tooth is fully prepared, we proceeded with the impression stage. Once the impression stage is completed , your dentist or his assistant will place a temporary (transitional ) crown (or bridge if multiple teeth were involved) on your tooth. These plastic (acrylic) restorations are placed on teeth to protect them and the gum tissues between dental visits. The temporary cementing medium used is designed to allow the easy removal of the temporary at your next scheduled visit. Home care is extremely important while your temporary crown is in place. The health of your gum tissue and the success of your final treatment restoration depends upon it. PLEASE do not be afraid to clean your teeth between visits. With a minimal amount of home care, you should be able to maintain the continued health of your teeth and gum tissue during the time required to fabricate your new crown. 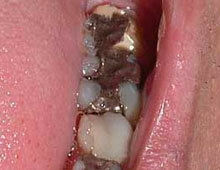 However, please do no floss the teeth either side of the temporary crown as it can dislodge it. The temporary crown will have to stay on for approximately two weeks while you new teeth are being made. Sometimes, even with meticulous care, temporary crowns or bridges may become loose between visits. 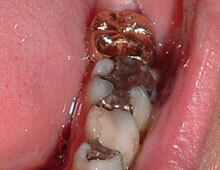 If this should occur, please place the temporary crown or bridge back on your tooth immediately. Putting a drop of Vaseline in the temporary crown or bridge will very often increase the retention and hold the temporary in place until you can schedule an appointment. If you can not replace the temporary crown yourself, put it in a safe place and call us. We will be happy to re cement it for you at the earliest possible moment. 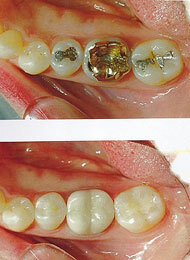 At that time, the temporary crown is removed and any temporary cement is cleaned from the prepared tooth. Your dentist will fit the final crown, check for accuracy, adjust for any bite discrepancies and evaluate the esthetics. If all of these factors are acceptable, the crown is cemented to your tooth. It is not unusual for the new crown to be mildly sensitive to cold temperatures for a few weeks. However, if the sensitivity is severe, does not subside, or if the bite feels uncomfortable, contact your dentist. Further adjustments to the crown may be necessary. There is a possibility of the nerve in the tooth dying during or after the crowning process, especially if the tooth has been previously heavily filled. The risk is usually less than 5% per tooth but this does depend on the teeth. It is always good to ask your dentist for a more specific estimation of risk.